Online businesses need website content to keep their pages engaging and interesting so that they can attract more people, or “traffic”. This is where you as an aspiring online writer come in. When it comes to written content for websites, demand far outstrips supply. With thousands of new websites going live every day, the demand for good content that will help these websites rank better in search engine results pages (SERPs) and keep visitors engaged is nigh-limitless. It is mostly this demand that online writers try to meet with their written work. Below we examine the most commonly encountered online writing jobs – and some unusual ones too. News sites also rely on a constant stream of fresh content to remain afloat. These sites usually employ permanent writers who often work remotely to produce newsworthy articles. Certain popular news websites pay their writers quite well, and landing a writing job with one of them will often mean a great career breakthrough for any online writer. Sometimes news sites will only employ people from regions specific to the news they cover, so not all writing jobs will be available for everyone. Informational websites stand or fall on the quality of their content. These sites examine a topic through static pages and articles that often need little or no updating once they’ve been published (so-called “evergreen” content), attracting visitors who want to be informed on that topic. Webmasters of such sites often invest heavily in good content, as it is the primary attraction of their websites. Online advertisements displayed on the page are usually closely related to the page’s content so that people visiting the info site will be likely to see ads that interest them. As in the bricks-and-mortar world, business online can be roughly divided into two categories: e-commerce businesses that sell products (whether physical or digital), and service-based businesses. Either way, their business websites require high-quality content to thrive. A company that’s selling a product or service online has to be able to explain what it’s selling to the potential customer, in a clear and persuasive way. This is particularly important if the company doesn’t have a real-world shop, or if it’s offering a technically sophisticated product or service – photos and videos are unlikely to be enough on their own to convey exactly what the thing being sold does, and what its benefits to the customer are. Not only that, but once the sale has been made the customer is likely to want some kind of support documentation. How-to articles, technical guides and troubleshooting articles all help build trust between business and customer – and help increase the likelihood of repeat sales. Numerous online businesses create products which they sell through the Internet. These products need to be promoted and properly marketed to become successful, and one of the most potent ways to do that is by featuring good sales copy for publication on the website or distribution via email. Creating sales pages is the job of copywriters, specialised writers with experience in advertising and marketing who know how to “sell” the features and benefits of a product to its potential customers in a way that maximises sales. 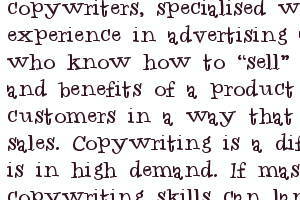 Copywriting is a difficult skill that is in high demand. If mastered, good copywriting skills can land an online writer countless high-paying jobs. Many businesses’ websites also operate one or more blogs as a sideline. These require content which is usually closely linked to the business developments of the company owning the blogs or which cover news in the market in which the company operates. It’s a generally accepted principle that word-of-mouth recommendations from real people are invaluable in winning customers. Many businesses invite online writers to review their products and give them a free review sample; some may even offer payment for doing so. Unfortunately, the more unscrupulous businesses take this a step further and employ writers to impersonate satisfied customers and weave fictional tales of how the product/service improved their lives. This may be good news for the online writer who lands a job writing fake testimonials, but writing fiction with the intention of selling it as fact is a business practice based on trickery. eBooks are digital books distributed online. Many online business models rely on eBooks of all topics and all qualities to thrive. These businesses will often hire writers to produce entire books on their behalf, either under the writer’s own name or as part of a ghostwriting agreement. When ghostwriting, usually the writer’s name is nowhere to be found in the credits and the writer relinquishes all rights over their creation. Many writers take the risk and publish eBooks on their own, a relatively easy task but one which is not guaranteed to bring a monetary return for their investment of time. We’ll come back to eBook publishing [in a later chapter]. The success of a forum depends on its members’ readiness to post useful and interesting information, comments and questions. However, owners of new and established forums alike may sometimes hire a professional writer to create posts and threads. This is done either to stimulate activity or to cover a specific topic that may be too technical to be broached by a normal member but nonetheless needs to be discussed on the forum. Paid forum posting is a legitimate way of making money online as a writer. However, some forum owners will go one step further and into the moral grey zone by asking writers to create misleading posts, use multiple accounts to create fake discussions and flood the forum with fake reviews and testimonials. There are other writing jobs that may be considered to be in a moral grey area at best, as their purpose is not clear to the end reader and they are created with the intention of deceiving. Quite often, website owners who seek to improve their websites’ rankings in the SERPs may opt to do so by creating links that point back to their website, known as backlinks. Backlinks vary in quality, depending on the site where they are placed. A relatively cheap and easy way to obtain numerous high-quality backlinks and boost SERPs is by getting links from authority forums and blogs. For that reason, website owners may employ writers with the sole task of creating accounts at these external sites and writing posts and comments with backlinks to their website. Twitter, Facebook and all other social media platforms are full of user-generated content, but a great deal of it is produced by professional writers. As with link building, clients may pay writers to summarise various bits of news, information and opinion in order to make tweets out of them, to post Facebook updates and sometimes even to create fake profiles from which to flood the social media with endorsements of products, services or persons. Some social media-related writing jobs require a great deal of writing, but most are just copy/paste tasks with little creativity involved. Rewriting jobs include taking an already written piece of content and changing it enough so that it passes for unique. These jobs often pay less than normal writing jobs and the end product is usually more or less content theft, thinly disguised by a flimsy veil of word substitution with the help of a thesaurus. It is often easy to spot rewritten content and, ironically, rewriting a piece so well as to be untraceable to the original is almost always harder than writing an original piece in the first place! Finally, there are many unorthodox online writing jobs one can pursue or find from time to time. Online writers may be asked to write CVs, biographies, memoirs, fake complaints, poetry, adult stories (there is a lot of demand for these), audio transcriptions and do all different kinds of unusual writing a client may want. You can buy WWWordsmith: Forging a living from online writing through any local version of the Kindle Store. For your convenience, we’ve provided links to all of them. If you have the time, we’d appreciate it if you could rate or review the book on Amazon too – it’s always good to have feedback. Thanks!